"The Poker Brat" Meets "W"
"Early bird gets the worm! Up at 8:10 am (sigh); heading out to say hi to Garth Brooks and @reggie_bush Then off to meet President GW Bush"
"WOW! Gave George Bush a signed book + signed beer can at his library at SMU + we hit it off really well! Found him to be witty + engaging..."
Hellmuth also posted a picture of himself talking to Bush and Condoleezza Rice, which you can see by clicking here. 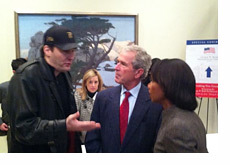 The picture inspired Tony G to take to his blog to write a post titled "Phil Hellmuth and George W. Bush best friends?" 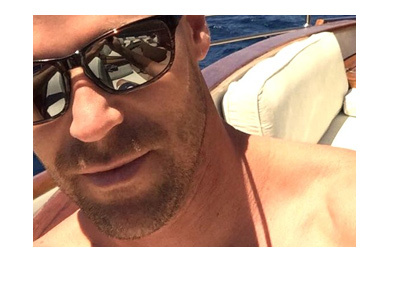 In the post, Tony G offered $100 to the person who could come up with the best caption to the photo. It's a bit funny that Hellmuth chose to wear a hat to the opening of the Presidential Library when everybody else in the picture seems to be dressed to the nines..